Here is a great-books style argument for the unity of Genesis, from Robert Candlish’s 1868 book on Genesis. 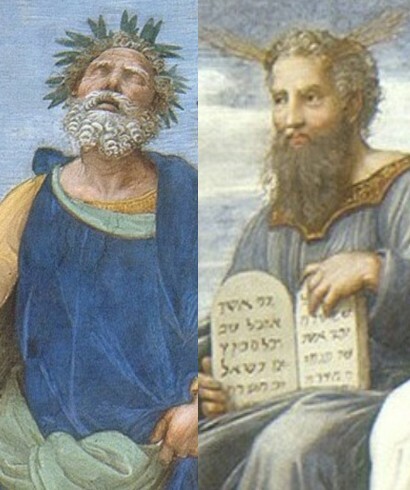 It turns on a comparison of Moses and Homer, but is mainly a matter of aesthetic perception of literary unity. Moses, as it seems to me, has fared very much as Homer has fared, at the hands of minute critics. In particular, the Book of Genesis has undergone the same sort of treatment as the Iliad. Both have been disintegrated, and torn into shreds and fragments; parcelled out among a motley and miscellaneous crowd of unknown documents and imaginary authors; and resolved into a mere medley of traditionary hymns or songs, strung together, –if not at random, by some fortuitous concourse of atoms;– by some marvel or miracle giving undesigned concinnity and completeness to the whole. For that is the phenomenon which is to be accounted for in both cases alike. And in both cases alike it is the answer to the objection urged against the historical tradition of a single authorship. The force of the answer lies in its being an appeal from word-catching and hair-splitting analysis, to the broad, general impression which a large-minded and large-hearted earnest reader cannot fail to receive. No one who throws his own soul into the Iliad, if he is at all capable of doing so, can have the slightest doubt as to its being a single soul with whom he has communion. He desiderates and demands a Homer; not a lot of song-writers but a solitary seer; a “vates sacer;” a genius creating unity because it is itself one. I believe it to be the same with Genesis. I think it has the stamp and impress of an undivided authorship. There is ac completeness about it, –an epic roundness, with beginning, middle, and end,– and with am marvelous adaptation and subordination of seeming episodes to the onward march of the plot,– that I confess I would rather question the unity of the Aenead, on the score of such interludes as that of Nisus and Euryales, or the unity of Hamlet, on the score of the grave-digging scene, than I would deny this Book of Genesis the unity of a sole and single authorship –not to speak of a sole and single divine inspiration. Candlish is making a large point, and I think he’s exactly right. If you’re just messing around with old books and dissecting them with critical tools, you’ve got your reward: a heap of Homeric fragments, an imaginary lineage of bards riffing on the cultural unconscious, an overblown JEDP theory, and so on. But if you’re reading in earnest, if you’re throwing your soul into the book, you’ll find a book worth reading. This overmastering sense of unity does not, I hasten to add, destroy our ability to register the layered diversity within the text. One of my favorite seminar exercises on Genesis is to spend time noticing the differences between chapter 1 and chapter 2. But the whole reason that’s interesting is because the one complex and unified text of Genesis has this kind of scope; to say that the differences are the result of them being two (conjectural, not empirical) documents is to wipe away nearly everything instructive about their coexistence. Candlish, by the way, considers his (1868) argument about the unity of Genesis to be “quite consistent with there being many traces in the book, both of earlier documents or traditions, and of later editings and revisions.” Those later editings could even include “subsequent emendations, interpolations, and alterations, which the book may have undergone from age to age, until its final revision was adjusted, perhaps in the time of Ezra.” Candlish (who says these things at the end of volume 2 of his detailed exposition of Genesis) is well aware of the bumps and lumps and loops and oddities of the text, and gladly appeals to hypotheses about prior traditions and later revisions. He just does this within the solid conviction that any readers worthy of approaching this text will know that they are approaching the single document of a great and unified mind.